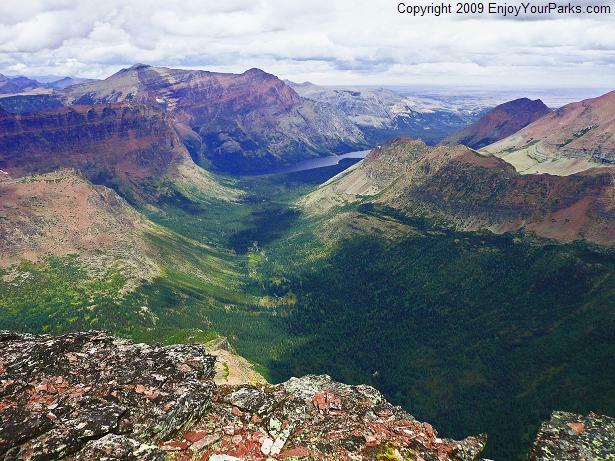 Grizzly Peak (9,067 feet) is located in Two Medicine Area, just south of Two Medicine Pass. 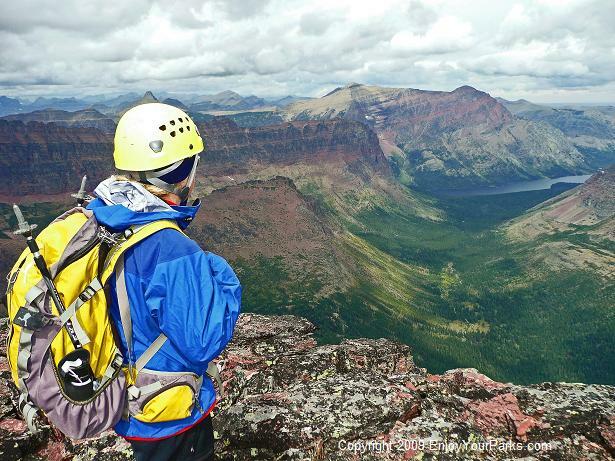 To climb this peak, be prepared for a 26+ mile day, because it's a LONG way from the parking lot at Two Medicine Lake to the summit. But even though it's a long way in and a long way back, it was definitely worth it because of the unique views this peak has to offer. 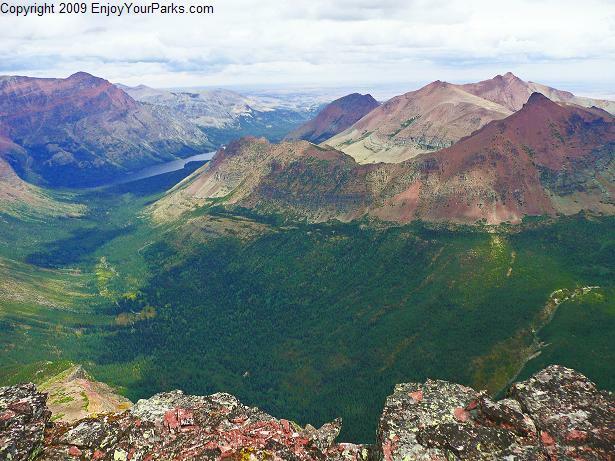 Since Grizzly Mountain is a long way into the backcountry, this peak provides views of mountains very seldom seen by humans. 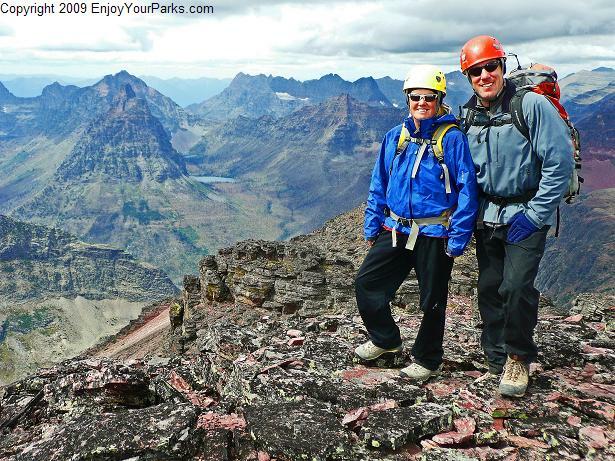 We were able to see some of the most remote areas of the southern section of Glacier Park, and it really was a thrill. Summitting this peak was interesting because there were at least 4 "false" summits. From below, they all appeared to be the same elevation, but only when we got on top did we determine where the true summit actually was. 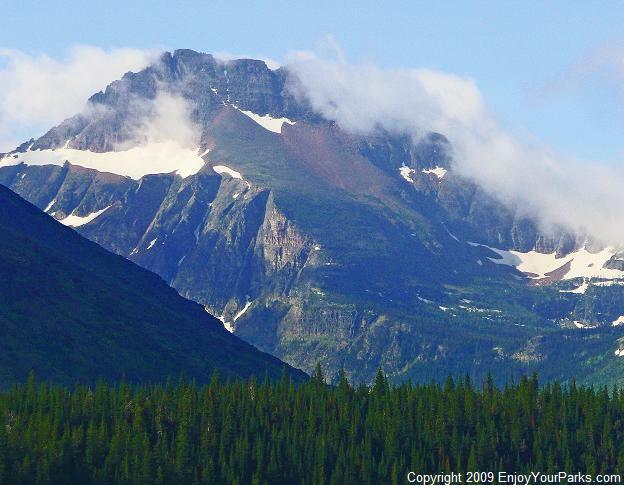 This is peak is named "Grizzly Mountain" because it's shaped like the back of a grizzly bear, and that's why it was difficult finding the highest point. 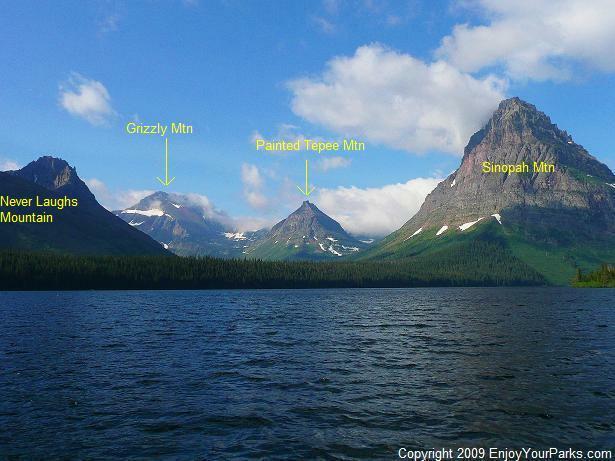 This is a view of Grizzly Mountain from the wooden boat "Sinopah" on Two Medicine Lake. The camera is facing southwest. Even though it looks close, it's not. 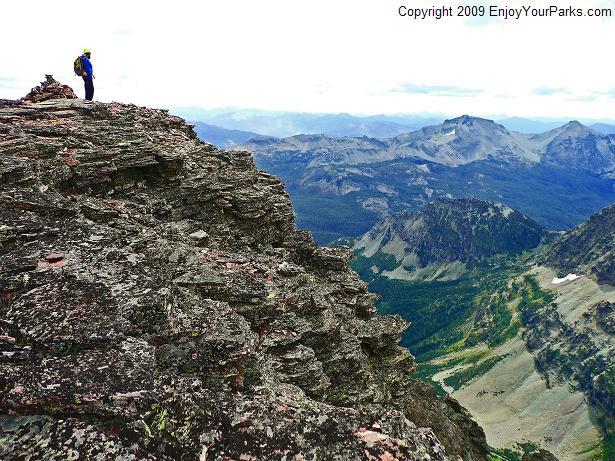 This is a very large, remote mountain that is very seldom climbed in one day. This photo was taken from the wooden boat "Sinopah" on Two Medicine Lake. Grizzly Mountain looks close, but the summit is over twelve miles from here. Grizzly is much taller than any other mountains in view, but it doesn't seem like it here because it's so far away. (The camera is facing southwest). Here we are on the summit of Grizzly Mountain. The lake behind us in the distance is Lake Isabel, and the sharp peak to the left of the lake is Vigil Peak. The peak just to the left of Shannon is Caper Peak. (The camera is facing northwest). Shannon is looking back down the valley to Two Medicine Lake (facing northeast). Our truck is parked at this lake, and is about 13 miles from where we are standing. The large peak just beyond the lake to the north is the famous Rising Wolf Mountain. The lower peak just to the right of Shannon is Painted Tepee Peak, and just beyond that is Sinopah Mountain. 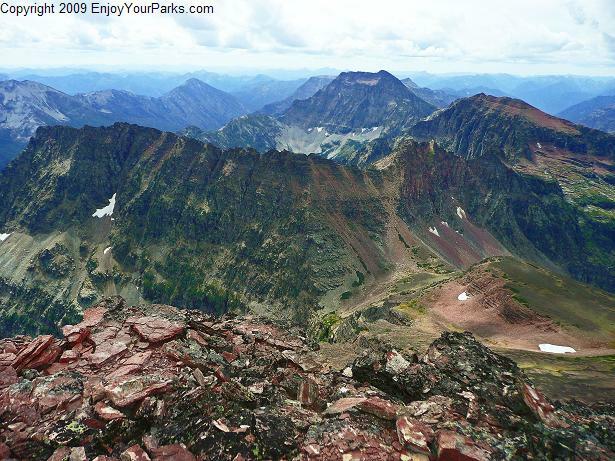 Grizzly Mountain has several "false" summits. Through some trial and error, we finally found the summit cairn. The curving peak to the right (closest to us) is Never Laughs Mountain, and the darker red peak to the far right is Mount Ellsworth. The taller peak beyond Ellsworth is Mount Henry. 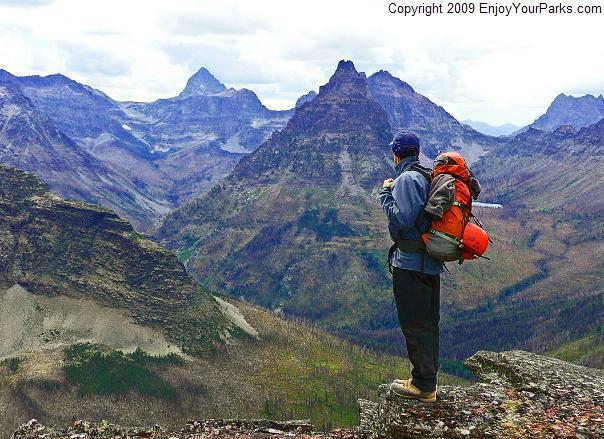 The peaks of the southern area of the park seem endless. 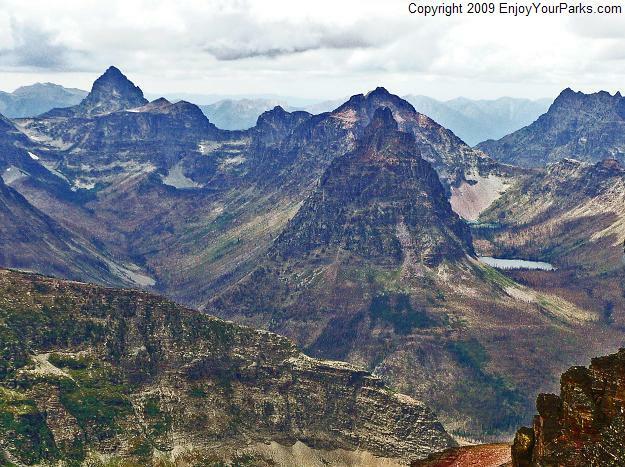 The names of these peaks are fantastic, such as Mount Despair and Eagle Ribs Mountain, and Lost Basin. These area is so remote that it rarely sees humans. Two Medicine Lake seems so close and yet so far. We climbed Grizzly Mountain very late in the season. Most of the summer, these peaks are covered in snow. This time of year, and especially on a dark, overcast day, the rocks almost seem "moonlike" in appearance. The tall spire to the left is the famous Mount Saint Nicholas. The sharp matterhorn to the upper left is Flinsch Peak, and if you follow the long ridge to the right of Flinsch it will take you to the summit of Rising Wolf Mountain, towering in the far right of this photo. In front of all this is the long ridge of Sinopah Mountain, and directly below us is Painted Tepee Peak. (Camera facing north) By the way, the tall, tan colored peak in the far distance (center) is Mount James of the Cutbank Area. 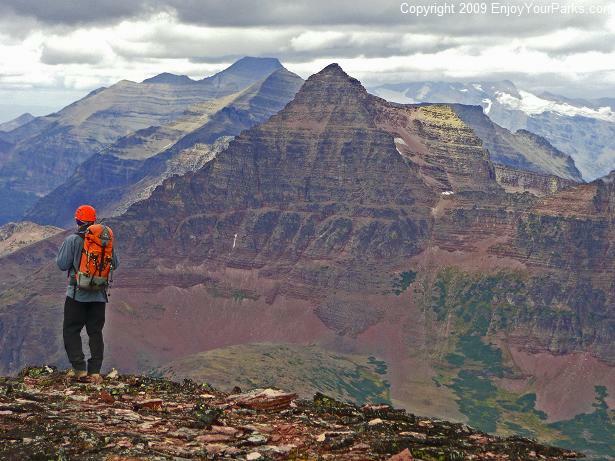 This is a view from Two Medicine Pass. Vigil Peak is just to the left of Dave, and Mount Saint Nicholas is to the left of Vigil. Lake Isabel is just beyond his backpack. (Camera is facing west). 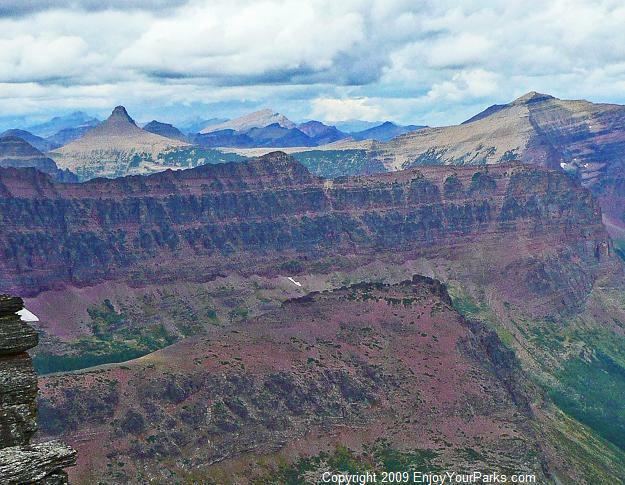 Grizzly Mountain is to the immediate south of Two Medicine Pass, and that's where the actual climb begins.